Due to the positions of Sun, Moon, and Earth, lunar and solar eclipses tend to be paired up. So it was that while we had a total lunar eclipse about two weeks ago, we enjoyed a partial solar eclipse this evening. As partial eclipses go, this one promised to be a good one. From our vantage point in Northeastern Ohio, we were to expect about 50 percent coverage of Sun’s bright face by Moon, a late-day event ending with sunset. After much deliberation, owing to the very low elevation of the eclipse over the western horizon, I decided upon a fishing pier on the south shore of Lake Erie. If we were lucky we would see a beautiful, crescent Sun sinking colorfully into the distance, reflecting off of the lake waters. That was the image in my mind, anyway. 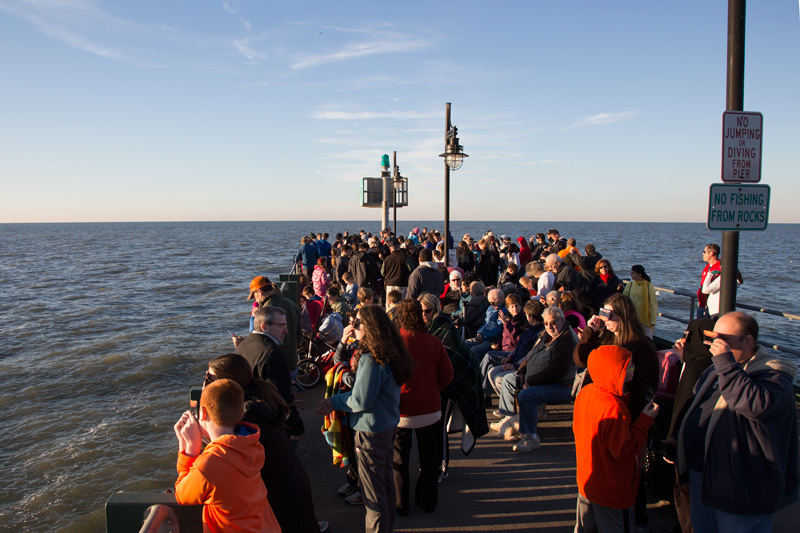 Crowd Watching Partial Solar Eclipse from Fishing Pier. Nobody Swimming or Fishing. The pier became packed with eclipse watchers and I was happy I’d arrived early and staked out a corner! Yesterday was cloudy and I could not shoot a test image of Sun without Moon but did get the opportunity today. 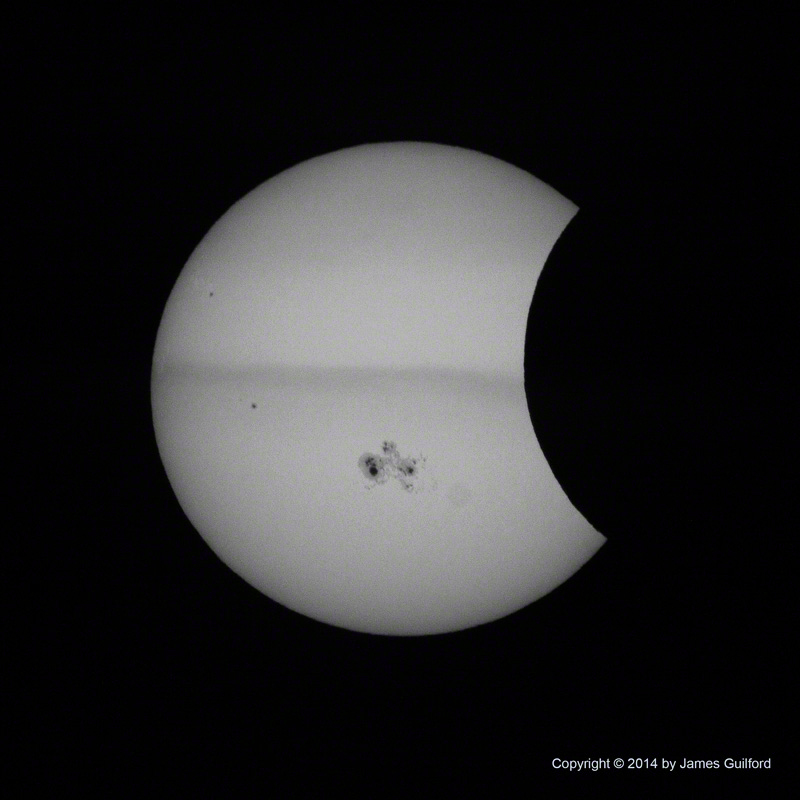 The image was very good and one of the best I’ve managed of the Sun. 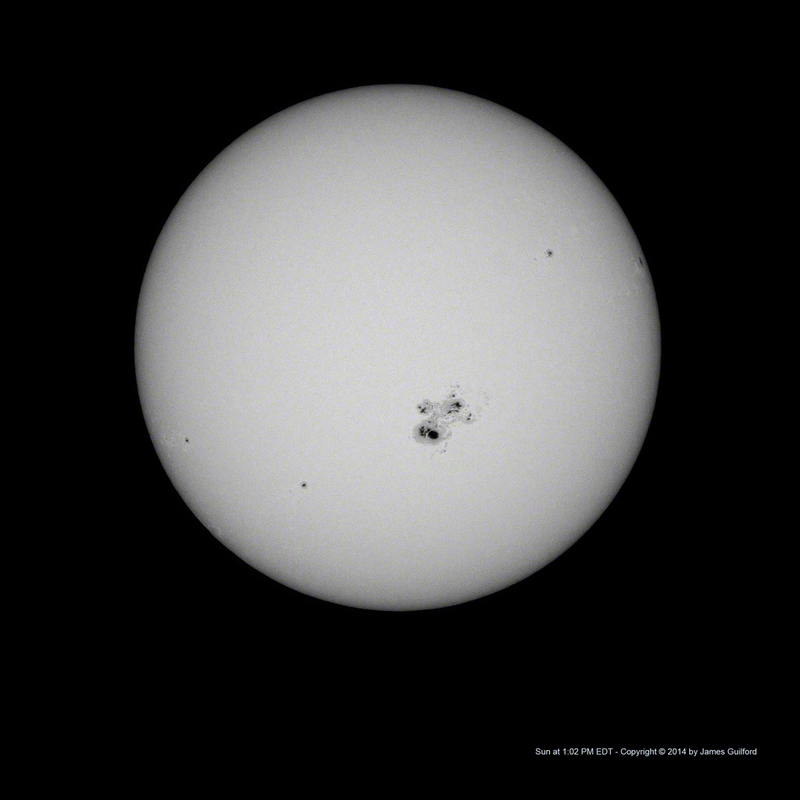 The solar disk was particularly striking because a massive sunspot cluster was visible … really massive, spanning nearly the distance from Earth to Moon (~ 250,000 miles) across the Sun! Very photogenic. As I mentioned, the eclipse was taking place late in the day, beginning at 5:42 PM EDT local time and in progress at sunset, about 6:35 PM — low to the horizon and in the messiest part of Earth’s atmosphere. The evening’s photos showed the lunar limb nipping off bit after bit of the Sun until the bright disk looked like a cookie with a large bite missing; a raisin cookie, I think, due to the sunspots! It wasn’t long, however, before we began to see streaks of cloud crossing that bright, chipped disk and before we knew it, the eclipse sank into distant clouds. There was no colorful sinking, no beautiful reflections, only a dark lake and fading cloud-obscured sunset. Later, processing the pictures on my computer, I could see that the eclipse images were nowhere near as good as I had hoped and didn’t compare well with the earlier tests. Why? Remember how I mentioned the low-t0-horizon position of the eclipse? The murk? The thick, wind-churned atmosphere robbed my images of their expected clarity. Am I disappointed? Yes, a little. 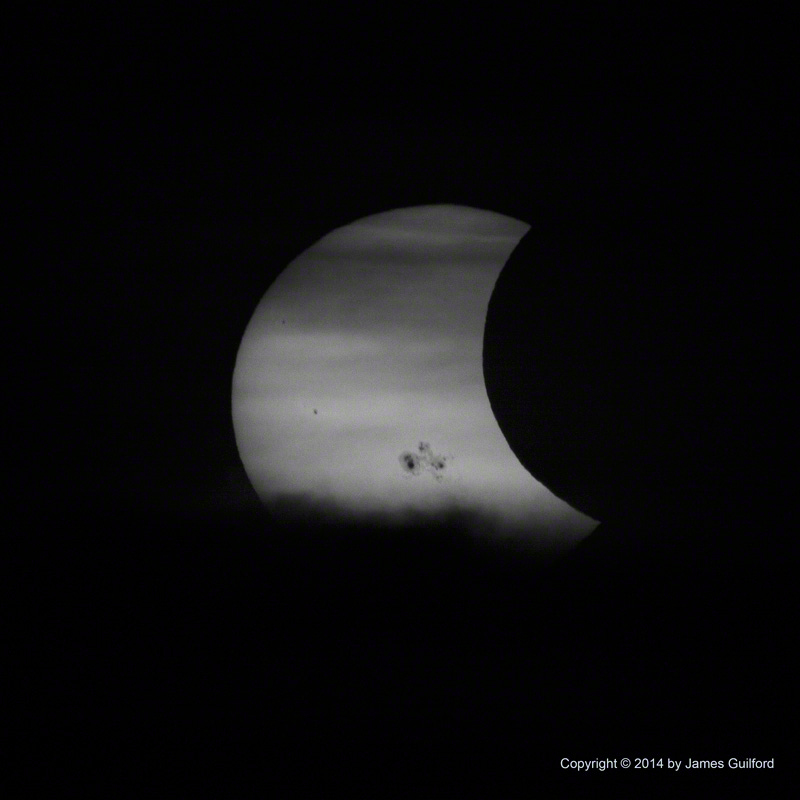 Still, it was a fine little eclipse and I was delighted to have seen it!